FEMINISM What does it mean? And what does it mean to me? Am I a feminist? I have an eleven year old daughter. She’s into art and sport and loves Girl Guides. She works hard at school and likes it, even if she complains about the amount of homework she has to do. She wants to attend college and become a dentist. 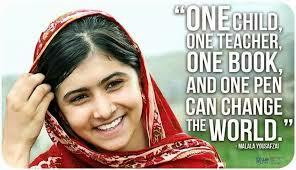 I was in the car with her recently and a piece came on the radio about Malala. 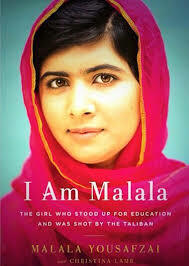 She asked me why Malala wasn’t allowed to go to school. I explained to her that in some countries girls and boys are not treated equally. I told her that there are 66 million ‘Malalas’ around the world, all denied an education just because they are girls. So where does feminism come into it? Here’s the science bit. The definition of feminism is this: a collection of movements and ideologies that share a common stated aim, to define, establish, and defend equal political, economic, cultural, and social rights for women. This includes seeking to establish equal opportunities for women in education and employment. Equal opportunities for women in education and employment. This is important – EQUAL OPPORTUNITIES. Many people think we don’t ‘need’ feminism anymore, that feminists are women who don’t like men or boys in some way. That is so wrong. Feminists are people who believe that girls and boys should be treated EQUALLY. It’s as simple as that. We are lucky in Ireland and the UK. Girls have the right to an education. But girls in other countries are not so lucky. I am absolutely 100% a feminist. I believe my daughter and my sons should be treated equally. If my daughter wants to be a dentist, I’ll do everything in my power to help her get there. What else does feminism mean to me? It means doing everything I can to ensure that ALL girls are treated equally, not just my own daughter. It means being kind and supportive to girls and women, helping them when I can, mentoring them. It means drawing attention to the inequalities that girls and woman face around the world. In short, it means supporting women and girls in my own community, my own country and in the wider world. Do you believe in equal rights for girls? Do you believe that all girls should have the right to an education? Then like me, you’re a feminist. Good for you! I’ll leave you with this fun video about being yourself and enjoying sport. It’s called This Girl Can.